There are a lot of factors that go into deciding on a cage for your hamster, but the most important one is the cage’s size. With this in mind, you’ve probably thought to yourself, what would be the right size cage for me to buy? The cage of a Syrian hamster (the most common pet hamster), should be at least 288 square inches in size (24 inches long by 12 inches wide). Bigger IS better when it comes to your hamster’s cage so try to get a larger cage if possible. However, there are still other factors to consider when choosing a hamster cage size: type of hamster, ease of cleaning, and ventilation. And if you keep reading, I’ll elaborate further on these factors to ensure you pick the perfect cage for your hamster. What’s the recommended cage size for a hamster? Filled with fun things to do! It’s the same with your hamster, really. We only know of a single scientific study on this topic. Published in 2007, researchers Gebhardt-Henrich, Fischer and Steiger, examined the behavior of 60 Syrian hamster females in cages of various sizes. The smallest cage in the study was 1,800 square cm in floor space, which is about the same size as 288 square inches. The largest was a huge 10,000 square cms large cage (that’s about 1,550 square inches). The researchers recorded the behavior of the hamsters, looking for signs of stress. Not surprisingly, the smaller the cage, the more stressed out the hamsters were. In the smaller cages, they chewed on the bars and tried to walk on the walls and roof of the cage. They were far more relaxed in the larger cage. Now, granted, at a home environment you’d be getting your hamster out more often. Also, there’s the question of just how many toys, running wheels and other “fun” things there are in the cage. Still, the bottom line clearly shows that hamsters enjoy larger cages. Let’s look into each one of these aspects. The are three common species of pet hamsters most people keep are Syrian, Dwarf, and Chinese. And as you might expect, each one has different needs when it comes to their cage sizes. The most commonly sold hamster in the pet marketplace, the Syrian, is also the largest at about 6 to 7 inches. With being the most common hamster, the general information you find about taking care of hamster is often based on this species. Therefore, the following general measurements mentioned above would be perfect for a Syrian Hamster: 24 inches long by 12 inches wide or bigger for an aquarium and a minimum of 2 square feet for a wire cage. Furthermore, it’s essential to note that most of the plastic cages won’t work for Syrians. See, the built-in wheels and tube are often too small for this particular species. If they do use these tubes and get stuck, it can end up being a nightmare. And since these hamsters are notorious for loving to play and run around, I’d also recommend going for a bigger sized cage rather than the minimum space required. If you don’t, it’s likely they’ll be more active in trying to escape. Lastly, it’s essential you realize these hamsters can’t be housed with one another. So, if you are looking into getting multiple hamsters, please refrain from getting Syrians. If you do, it’s likely they will fight each other because they’re very territorial about their living spaces. And if you already have a problem with hamsters fighting each other – of any species – make sure you read our guide on playfighting vs. fighting in hamsters. Given the name, you shouldn’t be shocked that Dwarf hamsters a bit smaller than their Syrian counterparts. Now, these hamsters come in three different types: Campbells, Siberian, and Roborovski. These Dwarf hamsters can range anywhere from 2 to 5 inches long. Due to this, you’ll a tightly secured cage that won’t allow them to escape. After all, their smaller size makes it much easier for them to squeeze through openings than it’s for Syrians. However, this enhanced ability to escape doesn’t mean you should get a much smaller cage from them. See, these hamsters still need a lot of room to run. And if they don’t, they can become quite a handful for the owner. With this in mind, you should stick to the 24 inches long by 12 inches wide or 2 square foot guideline. But if you’re on a budget, you can go a little under this guideline with a Dwarf hamster. Also, I’d consider getting a plastic modular cage with a dwarf hamster because the built-in wheels and tubes are a perfect size for them. However, there’s other one caveat these little creatures do bring to the table; if they’re introduced at a young age, they can be housed together. In fact, these hamsters tend to be happier living with a little friend. So, if you’re looking to get a Dwarf hamster, maybe looking into getting two and creating a little Dwarf hamster duo. But if you do get two, you’ll need a much larger cage to let each hamster has its own space. In other words, don’t be the person who stuffs two Dwarf hamsters in minimum space required cage. Trust me; it will be a disaster, and it will make your life a nightmare. Regarding necessary cage size requirements, there’s not much difference between a Chinese hamster and a Dwarf hamster. Honestly, there are only subtle differences between the two in general. Therefore, if you have a Chinese hamster, a 24 inches long by 12 inches wide cage should more than do the trick. And you must realize these hamsters are incredibly agile and are notorious for escaping their cages. Also, they’re a lot less socially friendly than a Dwarf hamster. Now, this personality trait doesn’t mean they can’t live with another hamster like a Syrian; but they’re a lot less get along with another hamster than a Dwarf one would. The more open space, the more fresh air your hamster’s going to breathe. And with this in mind, if you can afford it, I’d recommend getting the biggest wire cage possible. By doing so, you’ll be giving them the most access to the natural, breathable air they would encounter in the wild. On the other hand, if you decide to get a condensed plastic modular cage or aquarium, you’ll be restricting their fresh air access. See, the tubes and compartments can inhibit air flow, while aquariums have terrible ventilation. But there’s one these two types of cages do better than the wire ones, protecting your hamster from drafts. Due to this, if you do get a wire cage, make sure you chose an area that’s doesn’t experience too much draftiness. After all, you don’t want your little hamster to get cold during the night. Possibly the most important thing about the size of a hamster’s cage is just how much space you’re giving your little furry buddy for moving around. While you should let your hamster out of the cage at least once a day for supervised playtime, he or she will be spending most of the time in that cage. It’s up to you to make sure they have enough room in there. When there’s not enough space available, your hamster will feel stressed. What’s more, a large cage means you have more room for toys, hamster caves etc. Which basically means a more stimulating environment for your hammy – and a better quality of life. 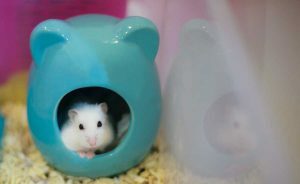 Again, with Syrian hamsters – the most popular of all pet hamsters – one per cage is the absolute guideline to stick to. 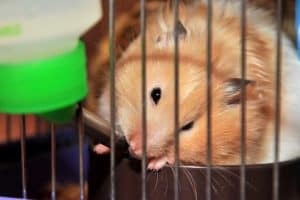 Unless you’re breeding a pair of hamsters – which you should not be doing unless you’re an ethical professional breeder of pet hamsters – they must always be kept one-per-cage. And as an FYI hamster breeders still keep Syrian hamsters one per cage, except for a very limited time window. However, with the smaller hamster breeds, you can keep more than one hamster in a single enclosure, tank or cage. In that case, the more hamsters you have, the larger their living space must be. Make sure there are enough private nook and crannies in there too. Is Ease of Cleaning a Factor in choosing cage size? 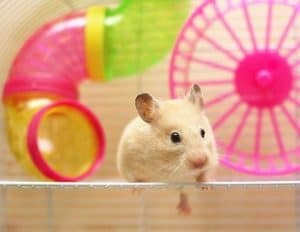 Now, if you aren’t too keen about cleaning your hamster’s cage, you might think a smaller option might be better for you. However, you should really keep your hamster’s well-being in mind above all. If you can’t commit to cleaning the enclosure or cage, maybe a hamster isn’t the right pet for you. The type of cage can affect how you clean it though. Check out this article about the frequency of cleaning a hamster’s cage. It addresses how much time and effort each type of cage requires. The complexity of the cage interior design may be more relevant to the cleaning of the cage than its size alone. After all, once you get everything out of there, it really doesn’t matter whether you wash a smaller or a larger container. What’s the Best Hamster Cage? Well, in my opinion, a hamster cage such as this one from AmazonBasics would be an incredible option for any hamster owner. I mean, it has everything you could look for in a wire cage. In the event, you’d want an aquarium, this one from Aquamasters is a fantastic option. For instance, it’s well within our size guideline and has numerous customer reviews praising its quality. However, it’s a little on the expensive side, as are most aquariums. And finally, if you’re looking for a plastic modular cage, this one from IRIS USA would be an acceptable option. Given it’s a plastic modular cage, it isn’t as long as we’d like; but it makes up for it by having three levels where your hamster can play. Overall, any of these three options should provide you with a high-quality hamster cage that you’ll be happy to own. It’s time to enjoy life as a hamster owner! Once you establish your preferences about hamster type, cleaning, and ventilation, finding the perfect hamster cage should be simple. And please, don’t stop researching until you find the best one possible for your circumstances. Trust me: it’s out there!